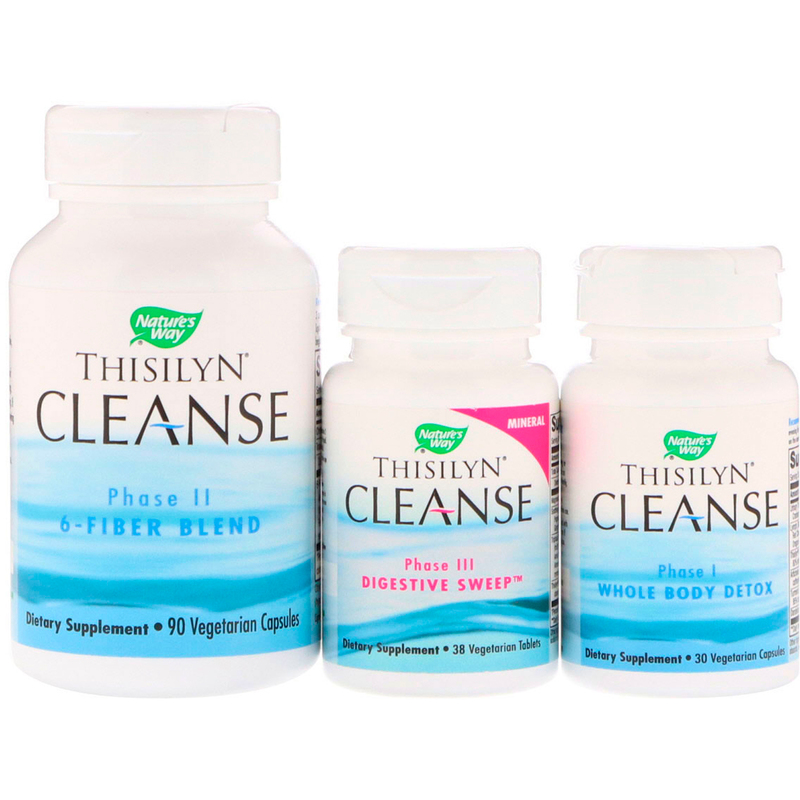 Purify, Rejuvenate & Energize with Thisilyn Cleanse Tri-Phase Program. 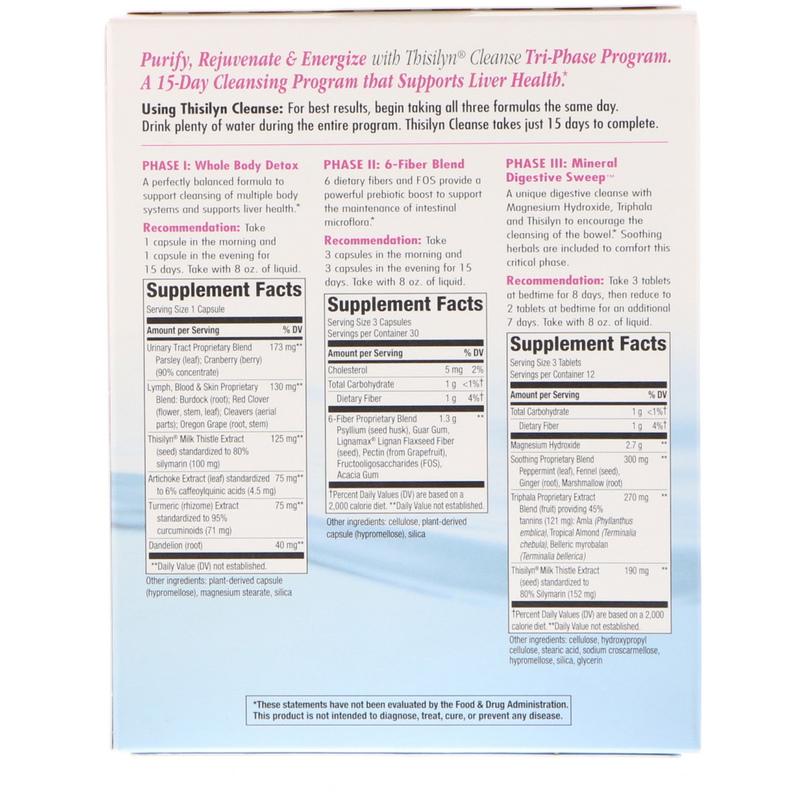 A 15-day cleansing program that supports liver health. A unique digestive cleanse with Magnesium hydroxide, Triphala and Thisilyn to encourage the cleansing of the bowel. Soothing herbals are included to comfort this critical phase. Specially balanced to cleanse the bowel, the Digestive Sweep formula in this program contains Magnesium hydroxide. How it works. Magnesium hydroxide encourages elimination by drawing water into the intestine, causing waste material to soften and swell and creating pressure in the colon. The body responds by promptly cleansing the bowel. Advantages. Magnesium hydroxide works in a gentle, non-stimulating manner. Alternative. Some individuals may need stronger action to encourage bowel cleansing. 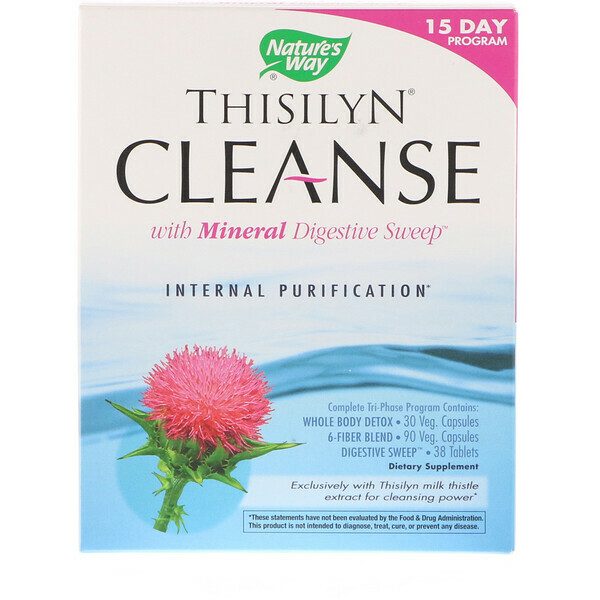 For this purpose, Thisilyn Cleanse is also available with an Herbal Digestive Sweep containing Cascara sagrada rather than Magnesium hydroxide. Vegetarian Formula No yeast, soy, wheat, gluten, dairy products, or preservatives. Take 1 capsule in the morning and 1 capsule in the evening for 15 days. Take with 8 oz. of liquid. Take 3 capsules in the morning and 3 capsules in the evening for 15 days. Take with 8 oz. of water. Take 3 tablets at bedtime for 8 days, then reduce to 2 tablets at bedtime for an additional 7 days. Take with 8 oz. of water. Caution: Do not use if pregnant, nursing, attempting to become pregnant, or for children under the age of 12. Do not use if you have bile duct obstruction, gallstones, or if you are allergic to plants if the Asteraceae (composite) family, including ragweed. Do not use when abdominal pain, nausea, or vomiting are present. If you experience chest pain, vomiting, or difficulty swallowing or breathing after taking the products in this kit, seek immediate medical attention. Do not exceed recommended period, as frequent or prolonged use may result in dependence. Consult a healthcare professional if you notice a sudden change in bowel habits that persist over 2 weeks. Rectal bleeding or failure to move bowels after use may indicate a serious condition, discontinue use and consult a healthcare professional. Take with at least a full glass of liquid, since taking with adequate liquid may cause choking. Do not use if you have difficulty swallowing. If you have diabetes, or are taking any medications, consult a healthcare professional before use.